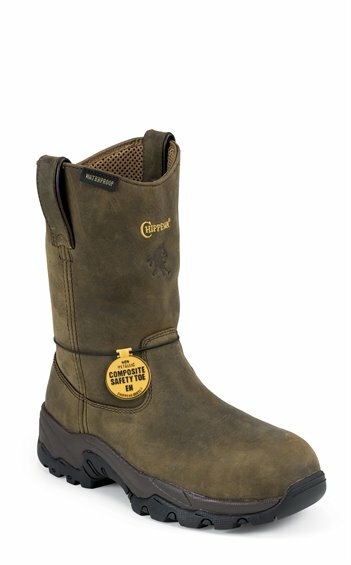 The Graeme Pull-On 10-inch tall men's boot features a rugged golden brown exterior crafted from quality leather and is waterproof with seam seal construction that helps keep feet dry. It has Texon® Flexwelt® insoles with a triple-density foam footbed and contoured arch support as well as air ventilation channels for moisture management. The anti-microbial hydrophilic-filler resists odor and bacteria and absorbs moisture so this boot durable to everyday wear and tear. Its safety toe is 35% lighter than a steel toe cap and has no heat or cold temperature transference. It's non-rusting and non-corrosive and meets or exceeds ASTM F2413-11 standards for impact and compression and the rubber outsole offers maximum traction and support on various terrain so you can feel comfortable and prepared no matter where this boot takes you. Second pair I have bought. Wear them everyday doing transmission line work. Great comfort very durable!!! Great pair of boots no break in just put them on and go. My husband loves his Chippewa boots I got for him!!! He says they are the BEST BOOTS EVER! I've had this pair a little over a month and already have a hole in the leather toe. You can see the composite material. Second pair I've bought. Great fit sturdy as heck. I have researched over 2-300 boots for days and these are BY FAR the greatest boot. They are convenient to slip on. They are absolutely water proof. They perform like a tennis shoe with out sacrificing safety. The dry fit mesh interior dries and breathes very well. The insulation is sufficient. I can bend the boot with my toes. They are light enough to dunk a basketball in. The insole makes me feel like a celebrity walking down red carpet. Is it no coincidence the insole says "The best by far."? PERIOD.